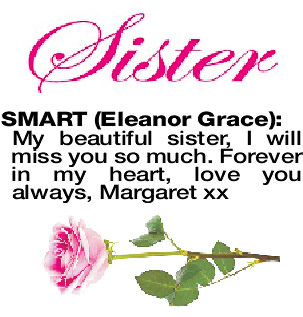 SMART ELEANOR GRACE Passed away aged 79 on Sunday 14th April. 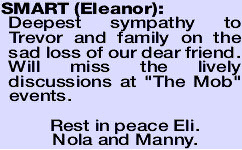 Loved and respected by all her friends and family. A wonderful caring lady that never stopped giving. 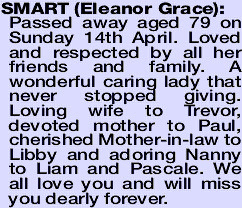 Loving wife to Trevor, devoted mother to Paul, cherished Mother-in-law to Libby and adoring Nanny to Liam and Pascale. We all love you and will miss you dearly forever. The Funeral Service for Mrs Eleanor (Ellie) Smart of St James will take place in our Chapel, 1307 Albany Highway, Cannington commencing at 10.00am on MONDAY (29.04.2019). Cremation will take place privately at a later time. By family request, please wear mauve or purple if possible. 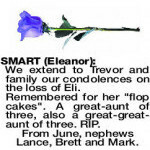 We extend to Trevor and family our condolences on the loss of Eli. 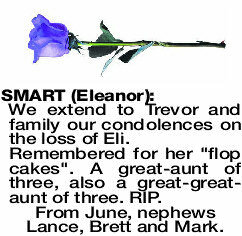 Remembered for her "flop cakes". A great-aunt of three, also a great-great- aunt of three. RIP. From June, nephews Lance, Brett and Mark. Dearest friend of Rosemary and John. 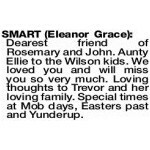 Aunty Ellie to the Wilson kids. We loved you and will miss you so very much. 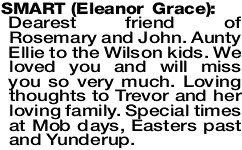 Loving thoughts to Trevor and her loving family. Special times at Mob days, Easters past and Yunderup. 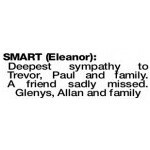 SMART ELEANOR Deepest sympathy to Trevor and family on the sad loss of our dear friend. 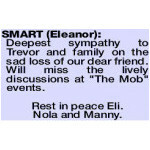 Will miss the lively discussions at "The Mob" events. 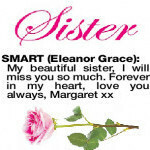 SMART ELEANOR In loving memory of Eli close friend for more than sixty years. 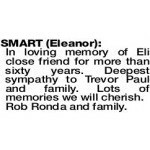 Deepest sympathy to Trevor Paul and family. Lots of memories we will cherish. A dear friend for many years. 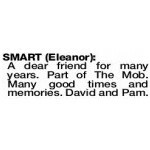 Part of The Mob. Many good times and memories. David and Pam.